Did you miss TWO FACES OF THE SEA? Here's another chance to see it! 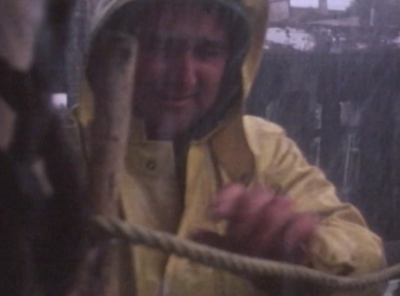 TWO FACES OF THE SEA tells the story of Maine fishermen and the difficulties they face every day harvesting the ocean. The documentary was filmed locally, in the 1970's, by Frank Cantor -- whose film career began in the village of Port Clyde, Maine. TWO FACES OF THE SEA was produced for Maine’s Department of Sea and Shore Fisheries by The Film Group, Inc. of Cambridge, Massachusetts. The theater has been a cornerstone of downtown Rockland since it opened in 1923; as a tribute to the many memories that midcoast Maine residents have of the Strand, the theater staff invites the community to contribute their memories and stories to a collaborative scrapbook. The memories, either of experiences at the Strand or of Rockland life in general, and from the near or distant past, will be compiled into a scrapbook that will be on public view at the Strand. Each person who offers us their story or memory will be entered into a weekly drawing for a Supporter’s Level ($100) Membership; four drawings will take place: on July 10, 17, 24, and 31. Submissions can be made in person at the theater; on Facebook; or by mail to the Strand Theatre, PO Box 433, Rockland, 04841. The celebration month will be capped off with “Rockland Days” at the theater; all Rockland residents will be invited to attend all Strand movies for free on Friday, July 31 - Sunday, August 2. Trekkies know: The transporter, or materializer, is a subspace device capable of almost instantaneously moving an object from one location to another. Transporters are able to dematerialize, transmit and reassemble an object. The act of transporting is often referred to as “beaming”. Non-Muggles know: A popular method of travel in the wizarding world, Apparition, is the magical action of travelling by focusing on a desired location—a form of teleportation. Whovians know: TARDIS (Time And Relative Dimension In Space) is a time machine/spacecraft, a product of the advanced technology of the Time Lords, an extraterrestrial civilization from the planet Gallifrey. A properly maintained and piloted TARDIS can transport its occupants to any point in time and place in the universe. There’s a TARDIS on Main Street and it’s time we talked about it—and yes, it is much bigger on the inside than it looks from the outside. Hundreds have been transported, in the last few months alone, through stories and music, to Newfoundland, Niger, Nashville, Nigeria, England, Austin, and Italy by simply stepping through the Strand’s front doors. Crossing the state, the country, and the world—while the travel may not be intergalactic, it is certainly international. From Western Africa with Beninoise singer-songwriter and activist, Angelique Kidjo, to the rollicking emerald hillsides of Ireland with Dervish, from the Texas borderlands with Alejandro Escovedo, to the cold French north with Le Vent du Nord, from La Perle des Antilles, Haiti with Belo, to the honky tonk western swing of Travis County with Asleep at the Wheel—the Strand stage has afforded us so many opportunities to travel in place through music. Sitting in the audience this past September with my seven year old daughter, listening to the Tuareg guitar virtuoso, Bombino, dressed in his colorful boubou and singing in his native Tamashek, I was struck by how fortunate we were to be having such an incredible cultural and artistic experience just steps from our own front door. It’s amazing to think that a world renowned musician travelled thousands of miles of physical, political, and cultural terrain, from the desert of Niger to our little city on the coast of Maine, and here we were, having walked two blocks from our house to the Strand, broadening our global perspective and awareness in a way that typically only happens through border crossing travel and immersion. When the stage is dark, the Strand screen offers additional passage in time and place. Week to week the destinations change, but the overall experience of being transported, through words and pictures, remains the same. The opportunity to deepen our understanding and experience a world outside our own, to be challenged, comforted, educated or entertained, exists, right here on Main Street, whenever the Strand’s doors are open. From the sidewalks of Rockland, Maine through the Strand’s doors, you too can travel in place. The Strand Theatre’s new membership program begins on April 17th and will provide an opportunity for community members to support the theater while enjoying some perks. 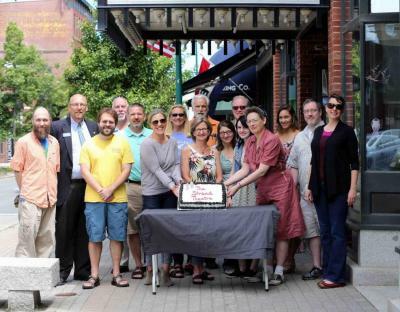 The ninety-year old Strand, a landmark of the downtown area, recently became a non-profit organization when the Simmons family donated it to the Friends of the Strand Theatre (FOST). As a non-profit, tax-exempt entity, the Strand can now accept tax-deductible gifts and pursue grants from a variety of sources to underwrite its programming. Community membership support will make it possible for FOST to maintain the historic theater’s facilities along with its state-of-the art projection and sound systems. Funds from membership will also underwrite the Strand’s unique independent film program and its diverse, year-round venue of live music, performing arts and special events. Among independent theaters around the country offering membership programs dues represent about 9% of total income. The Strand recently received the Penobscot Bay Regional Chamber of Commerce’s Annual Award for Innovation in Business, recognizing it as an organization that has demonstrated a proactive and innovative approach toward finding solutions to business challenges and has embraced change as an opportunity for growth. To find out more about becoming a member, please contact our membership coordinator at membership@rocklandstrand.comor call 207-594-0070 (extension 5). To learn more about how you can support The Strand or to make a tax-deductible donation, please contact Strand Executive Director Sarah Ruddy at saraatthestrand@gmail.comor call (207) 701-5053. Simmons Family gives the theater to "Friends of the Strand"
What’s Happening at the Strand? 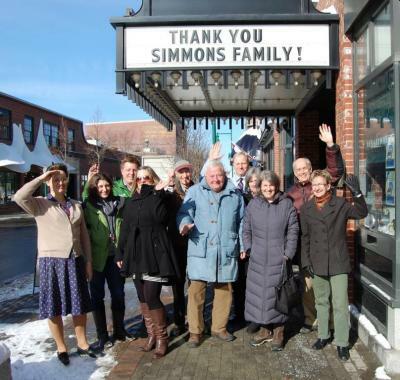 The Simmons Family has given the Strand Theatre to Friends of the Strand Theatre, a Maine non-profit corporation. Friends was formed in August 2013 with the express purpose of eventually owning and operating the Strand once the IRS granted the theater tax-exempt 501(c)(3) status. Ten years ago, Ellen and Matt Simmons purchased and extensively renovated the Strand, transforming the 1923 building into a state-of-the-art theater and cultural center. Since that renovation the Simmons family has provided generous financial support to the Strand’s operations. Two years ago the family asked a small committee to explore future options for the theater in order to put it on a more sustainable path. That committee evolved into a board tasked with oversight of theater management and strategic direction. The board and the Simmons family eventually agreed that the best option for both the Strand to continue as a viable business and for the community at large to reap the economic and cultural benefits this historic institution offers was for the theater to become a non-profit, tax-exempt organization. And now, because of the foresight and generosity of the Simmons family this has happened. Why did the Strand become a non-profit? As a non-profit, tax-exempt entity, the Strand can accept tax-deductible gifts and pursue grants from a variety of sources to underwrite the high quality programming its audiences have come to expect. The Simmons family and the Friends of the Strand Theatre Board believe that non-profit status will secure the future of the Strand as an independent theater for the community. Nationally, successful independent theaters tend overwhelmingly to be owned and operated as non-profit businesses. Will we still have the same kind of programming? Yes. 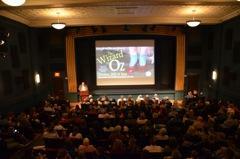 The Strand will continue to offer the same high caliber cultural and educational programming it always has. Going forward, we hope to attract an even wider audience with the best of film, theater, music, educational and community events available. What will change and when? Many of the changes will be behind the scenes and have already taken place. There is a new board in place which has been overseeing theater operations and exploring a non-profit path for the theater since December of 2012. Executive director Sarah Ruddy has been focusing on continuing to grow the Strand’s innovative programming line-up for almost a year. It’s important to us to keep offering what our audiences love and to keep doing what we do well. At the “front of house,” very little will change. For example, the recent addition of a digital cinema projection system means that we will be able to continue screening all the best new films. But because we are keeping our 35 mm projectors we can also show traditional films prints the tried and true way. And not to worry, Liz will continue to preside over the theater as she always has. How important will community support be? Essential. The Strand is counting on the community to support operations by continuing to attend the theater and buy tickets. Other support activities will include an annual fundraising drive, volunteer opportunities and most exciting, a membership program to be launched in April. Stay tuned for details. We look forward to having you all in the family and can’t wait to share this new program with you. For more information on how to support us, please visit: http://www.rocklandstrand.com/donate. Donations can also be sent to the theater at 345 Main Street, Rockland, Maine 04841. Or stop by and pick up a donation envelope in the lobby or from one of our staff. Any contribution will be greatly appreciated and will ensure the continued operation of the Strand. All donors making gifts of $100 and above between February 7th and April 2nd, 2014, will be recognized as Founding Members and granted membership benefits at the level corresponding to the donation. Who can I talk to if I want more information about the Strand? Contact: Sarah Ruddy, Executive Director at sarahatthestrand@gmail.com or at (207) 701-5053. 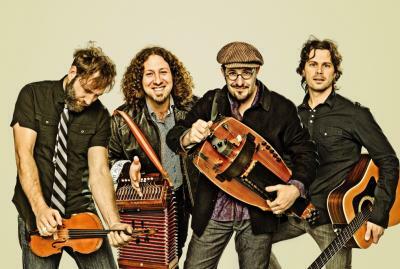 Since its founding in 2002, Le Vent du Nord have become compelling Francophone ambassadors, winning critical acclaim and audience adoration across Europe and North America. The band delivers catchy songs and tunes, some taken from the Québec traditional folk repertoire while others are original compositions. Considered a driving force in progressive folk, Le Vent du Nord captures the energy and mirth of a Saturday night kitchen party, infusing old Québec with a breath of fresh, cosmopolitan air. The quartet has performed well over 1,000 concerts, racking up several prestigious awards, including a Grand Prix du Disque Charles Cros, two Junos (Canada’s Grammys), a Canadian Folk Music Award, and 'Artist of the Year' at the North American Folk Alliance Annual Gala. Le Vent du Nord presents a new show with the songs of Tromper le temps (Fooling Time), its 7th album (released in Spring 2012). With this album Le Vent du Nord explore the past and the present socially, politically and personally. They manage to do all this by anchoring their musical traditions in the present, coming up with fluid arrangements, great instrumental and vocal skills and the best in contemporary production. Le Vent du Nord are: Simon Beaudry on vocals, bouzouki, guitar; Nicolas Boulerice on vocals, hurdy gurdy, piano, piano-accordion; Réjean Brunet on basses, diatonic accordion, jaw harp, piano, vocals; Olivier Demers on fiddle, electric guitar, clogging, mandolin, vocals. The album was recorded at Studio de la Côte Jaune by Marc Busic, mixed at Studio Marc Busic by Le Vent du Nord and Marc Busic, and mastered by Marc-Olivier Bouchard at Le Lab Mastering. In addition to their traditional repertoire, the group exhibits great finesse and flexibility, appearing regularly on Canadian, American, French, and UK television and radio, and participating in a wide variety of special musical projects. They’ve collaborated and performed with Harry Manx, Väsen, The Chieftains, Breton musical pioneer Yann-Fañch Kemener, Québecois roots legend and master storyteller Michel Faubert, hip Scottish folk band Breabach, and the trans-Mediterranean ensemble Constantinople. Le Vent du Nord have also created a symphonic concert, presented by the respected Portland Symphony Orchestra and Québec Symphony Orchestra, that “puts all traditional folk naysayers to shame” (Voir Montreal). This concert will be presented again with The Victoria Symphonic Orchestra in March 2014.